A Voce Columbus also has a wonderful wine list by Olivier Flosse who holds the coveted DUAD, Diploma-Universitaire d’Aptitude a la Degustation, Bordeaux, the most prestigious wine diploma in Europe. 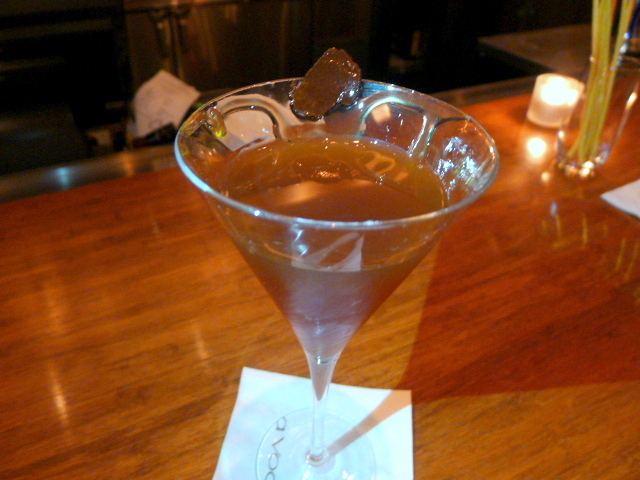 Prior to joining A Voce, Flosse was an assistant to the talented Jean-Luc Le Du at Daniel Restaurant and the wine director and sommelier at Cafe Boulud in New York City. We tried a variety of antipasti from the a la carte menu including the hamachi crudo ($20), slices of yellowtail that were wonderful and flavoursome. The fish had been topped with avocado purée for some savoury overtones, lemongrass agrodolce for acidity and fresno peppers for sweetness. 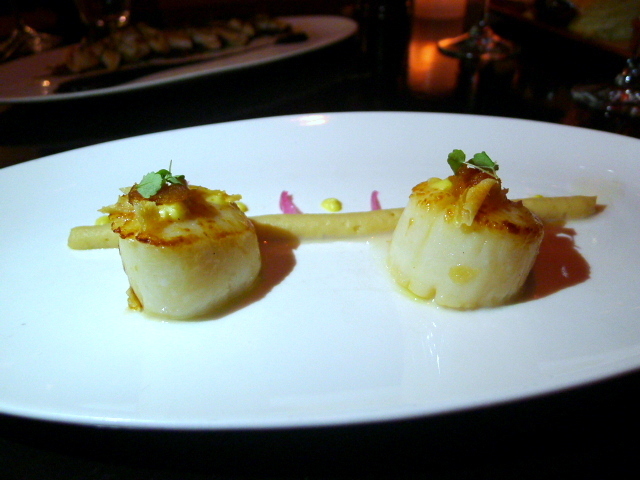 Also really tasty were the beautifully cooked scallops ($25), seared and served with a tasty combination of lemon marmalade, celeriac cream and bottarga. Crudo di gamberi, a carpaccio of Atlantic red ruby prawns was a delight to eat as the prawns were lovely and sweet, especially with its accomplished garnish of meyer lemon and haricot vert cream. 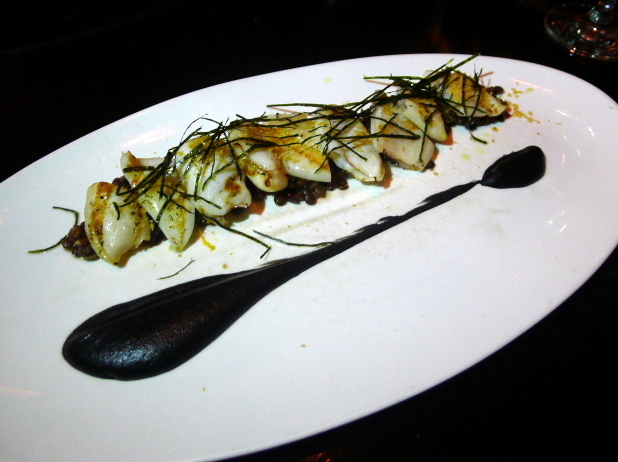 But the outstanding antipasta of the day was the smoked baby squid ($17), served with lentils, squid ink sauce and seaweed. The smokiness coming through from the squid was beautifully judged and the lentils were earthy and warm with a touch of acidity to liven up the dish. The sauce was also delicious and all the elements came together for what was a fabulous plate of food. 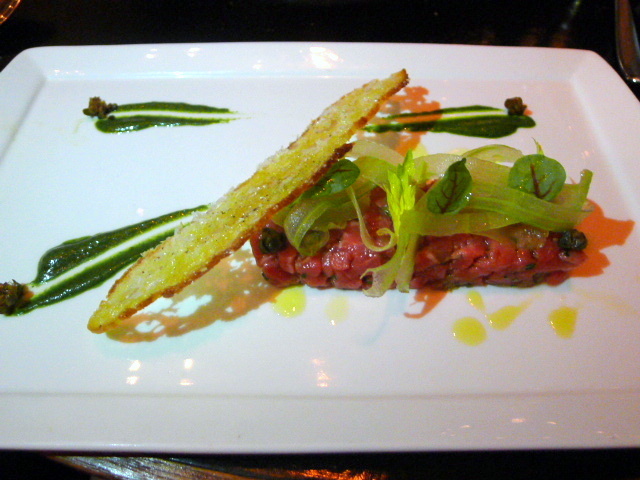 In contrast, the least successful of all the antipasti was a meat dish, the Piedmontese beef tartare ($21) with salsa verde, horseradish and Parmesan crostini. The quality of the beef was excellent, but the dish as a whole needed a little more seasoning to make it a more exciting plate of food. 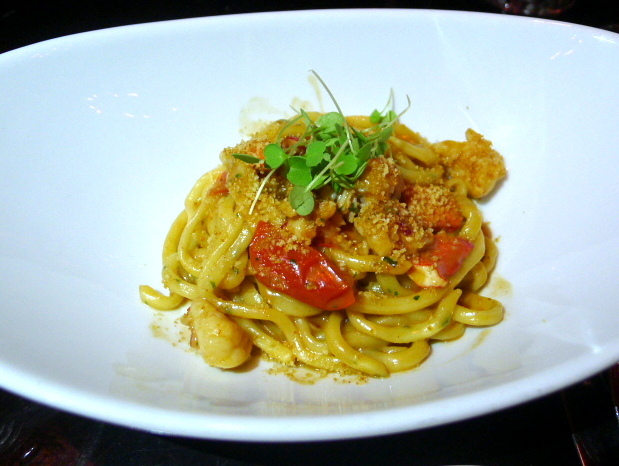 Handcrafted pasta with Maine lobster and gremolata ($29) was sublimely tasty with perfectly cooked pasta that gave way to a little chewiness. The sauce was lovely and the sweet lobster was delicious, although we would have liked more pieces of lobster. 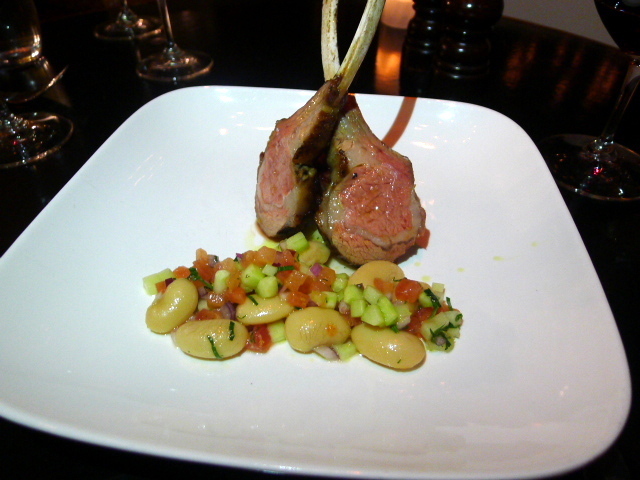 Our final savoury course was the lamb chops ($45) with sausage, corona beans and salsa di verdure. The lamb was exceptional, extremely flavoursome and very tender. The beans were cold however, and a warm accompaniment would have worked better with the dish. Desserts were very enjoyable with the ‘Pink Lady’ ($12) consisting of a fabulously light and refreshing combination of yoghurt mousse, raspberry sorbet, meringue and fresh berries. 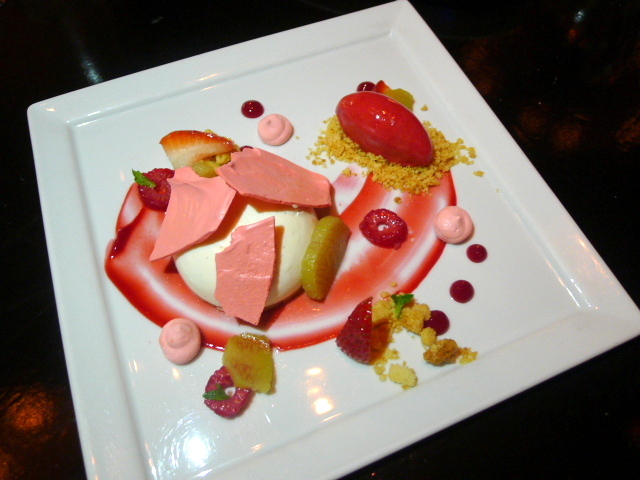 There was some vanilla crumble for added texture, and some tangy rhubarb that brought the dish together with its hint of acidity. 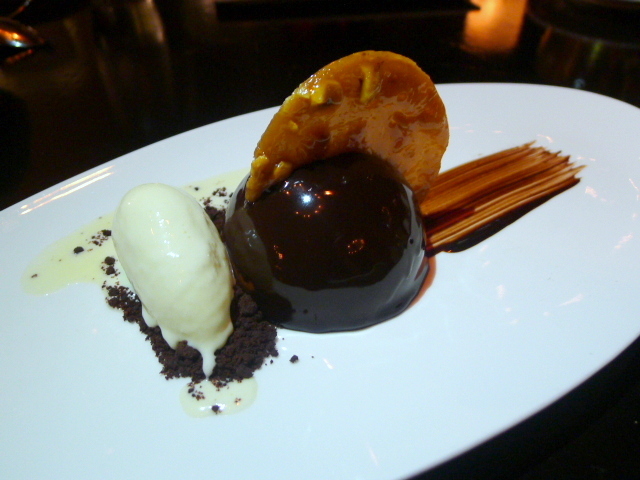 A tiramisu ($12) presented as a chocolate dome was decadent, yet light in texture, and accompanied by an almond gelato, chocolate cookie crumble and a hazelnut and almond Florentine which was deliciously crispy. A Voce Columbus showcased a well-conceived menu consisting of simple classics that had been elevated to a higher level of elegance. We couldn’t fault this excellent and accomplished demonstration of cookery using some of the most fabulous and freshest of ingredients. We had our particular favourites, but on the whole everything tasted wonderful. The service was pleasant, although a little brisk at times, but in all A Voce Columbus was an excellent experience. Prices: $57 to $132 for three courses, excludes drinks, taxes and service.